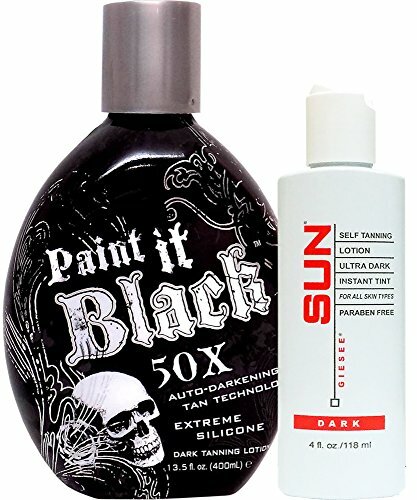 Millennium Tanning Paint It Black 50X,13.5 NEW Unique Auto-Darkening Tan Technology delivers extreme dark bronze tanning results through its super luxurious silicone emulsion blend. Experience stunning dark tan color and ultra moisturization that lasts all day. Accelerating, Bronzing, Skin Firming, Silicone Emulsion Fragrance: Fresh and Clean Cotton Blossom. Suitable for all ages as this product does not contain a tingle!!! GLOWING FROM THE INSIDE OUT Have you ever noticed that when someone feels and looks great, they just glow? Sure it could be that they've lost weight, or are in love, or just have that confidence we all yearn for. But maybe it's as simple as they've tried the Sun Laboratories Self Tanning Product and now they look slimmer, darker, and more radiant - thus they are glowing from the inside and out! If you have any questions about this product by millennium Tanning Products, contact us by completing and submitting the form below. If you are looking for a specif part number, please include it with your message. Credentials Suncare Essentials Sunless Tan For Face & Body 7 fl. oz.